It's the fourth ‘good start to winter' in a row in Scotland after an unseasonably warm November and the second year that all five areas have opened before Christmas. The resorts on the west coast often have very different weather conditions to those on the East coast meaning it is quite common for one side to open and the other not. Nevis Range, the last to open, had hoped to open last weekend, one week earlier than planned, due to the significant snowfall on the slopes and final preparations were well underway until the storm hit. High winds are regularly recorded on the slopes of the Aonach Mor where the ski lifts and runs are , and ongoing maintenance and repair work is very much part of normal life operating a ski resort. However with wind speeds of well over 130mph (208mph) recorded on the summit last Thursday, Nevis Range knew that its return to business as normal would be somewhat challenging. 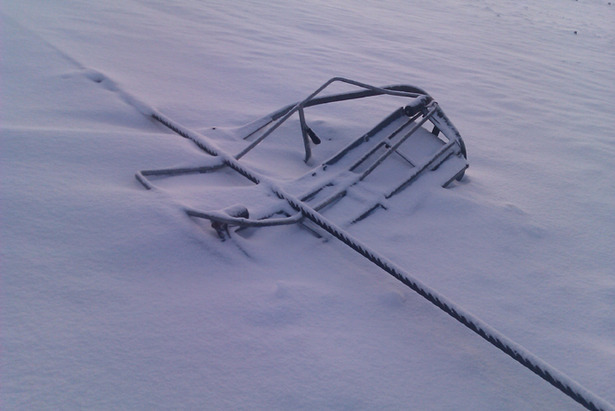 When the winds subsided and staff were eventually able to access the mountain at the weekend, they found that almost every lift and chair had been 'de railed' and large lengths of the cable had fallen deep into the snowy ground, bringing with it chairs and t-bars crashing to the ground. The Quad Chair in particular had been one of the most extensively damaged; around 15 chairs were found to be completely irreparable and a further 25 chairs needed to be brought back down to the workshop to be more fully assessed and repaired. The Engineering team at Nevis have been working flat out to repair this damage. The good news is that at the moment there's plenty of snow on the slopes and more is forecast on the upper slopes this week. Most runs are now complete with good cover and there's good skiing on and off the runs. Skiers can easily ski back to the top station and the Snowgoose restaurant and bar, as well as to the base of the quad chair. There's ample beginners area and Snowsports School and Equipment Hire will be operating from Saturday. For its opening weekend the resort plans to run Linnhe, Alpha, the Goose T bar and they also hope to get the Summit tow operating by Saturday afternoon. The Quad chair is still being worked on. However ALL of the runs on the main area of the resort on the front of the hill can be accessed by the lifts that are planned to open. The resort is also gearing up for its Christmas activity, and will stay open every day, apart from Christmas day itself, with skiing and snowboarding, Christmas food and Santa himself is expected to arrive for a ski on the 23rd and 24th of December.